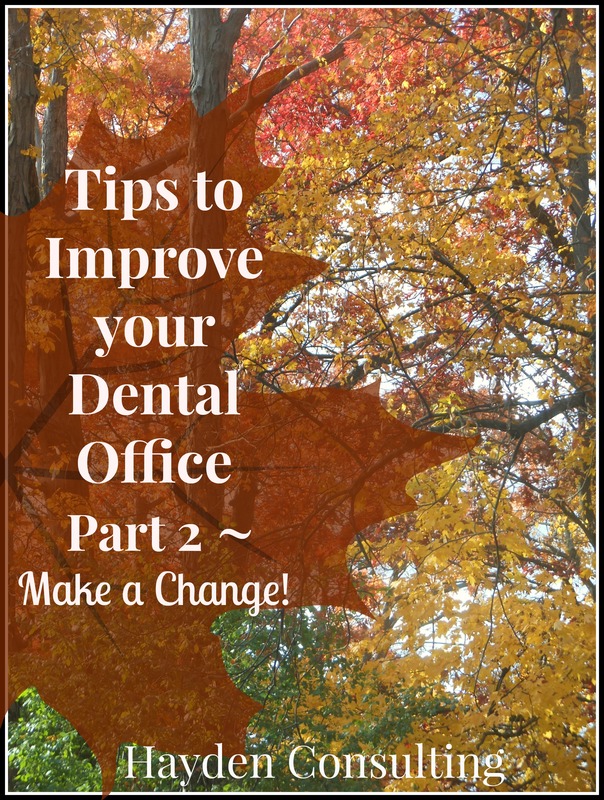 Tips to Improve Your Dental Office Part 2 – Make a Change! – Hayden Consulting – Where Your Success in Business and Life Matters! Tips to Improve Your Dental Office Part 2 – Make a Change! End the insanity – If you’re unhappy with your production & collection numbers, toxic team members, the schedule always falling apart, not enough new patients and a run down, out dated practice… now is a great time to make a change or 20 changes. Great advice from The Madow Brothers!! If you don’t currently follow them, I highly encourage you to visit their website. Here is the link: www.madow.com. Current Protocols – Hygiene Continuing Care , Incomplete Treatment Reports, Confirmation, A/R-Collections, Greetings, Patient Hand-off, New Patient Welcomes and Referral Thank you’s, etc. Job Responsibilities/Descriptions – Have every team member write down a detailed list of all of their job responsibilities. This is VERY helpful in determining more effective ways of doing things as well as finding out what is NOT being done. The Team – Under/over staffed, Uniforms/Dress Code, Attitudes (adjusting or removing the toxic, crabby & lazy ones AND) acknowledging and rewarding the positive, happy, hard-working ones), Employee Benefits and Expectations, Team Meeting/Morning Huddle Effectiveness and Frequency. Equipment/Technology – Computers, Software, Internet Speed & Access, Printers, Copiers, Telephone Systems, TV’s, Postage machines, including…dare I say, type writers? and all other “must have” Equipment/Products that were purchased at dental seminars or from sales reps. Check treatment rooms, lab, closets, shelves and work stations for any equipment that needs to be updated, repaired or tossed! While you’re at it, if there is anything that isn’t be used properly due to lack of education/training, go ahead and schedule time for continuing education/training. I’m sure as you were reading this list you thought of other area’s to investigate. Maybe you knew right away of things that have been nagging at you for a while now, things that are driving you insane. Change them. Don’t wait. You will be so happy when you accomplish these necessary changes. If you feel like this is all just too much for you, or that you would rather focus on taking care of your patients, I’m here to help you. I happen to LOVE helping Dentists and their Team Members make changes. Contact me for a Complimentary Consultation – email: bhaydenconsulting@gmail.com. Please keep me updated by sharing your success stories of change. Or if you have any questions, comments or concerns, I’m happy to help. Are you receiving my complimentary Practice Management and Marketing Idea’s in your email inbox each month? If not, please subscribe today. Feel free to tell your dental friends all about us so they can start benefiting from these dental idea’s too. This entry was posted in Customer Service Tips, Dental Success, Marketing Ideas, Practice Management and tagged albert einstein, betty hayden, betty hayden dental consultant, betty hayden hayden consulting, business success, change is good, chiropractic marketing, chiropractic marketing ideas, cosmetic dental marketing, customer service, definition of insanity, dental advertising, dental coaching, dental consultant, dental consulting, dental continuing care ideas, dental education, dental marketing, dental marketing consultant, dental marketing goals, dental marketing ideas, dental office success, dental practice management, dental protocols, dental recare, dental recare ideas, dental success, dental systems, dental team meetings, exceed expectations, exceed patient expectations, hayden consulting, how to bring in new patients, how to fill the schedule, how to get more new patients, how to grow your dental practice, ideas to improve your dental office, improve your dental office, insanity, jim rohn, madow brothers, make a change, marketing for dental specialists, marketing for ortho office, marketing ideas, marketing ideas for chiropractors, marketing ideas for dentists, marketing ideas for orthodontists, marketing ideas for pedo office, marketing your dental practice, ortho marketing, orthodontic marketing ideas, pediatric marketing, practice management, team building, the madow brothers, tips for dental marketing, tips to get new patients, treatment plan presentation, what to do during downtime, william pollard. Bookmark the permalink. Pingback: Tips to Improve Your Dental Office, Part 1 ~ First Impressions | Hayden Consulting – Where Your Success in Business and Life Matters! Pingback: Tips To Improve Your Dental Office, Part 3 ~ The Little Things Matter | Hayden Consulting – Where Your Success in Business and Life Matters! Pingback: Dental Marketing Idea’s for Pediatric Office – Hayden Consulting – Where Your Success in Business and Life Matters! Pingback: Tips to Improve your Dental Office Part 4 ~ Happy Team – Hayden Consulting – Where Your Success in Business and Life Matters! Pingback: Ideas to Fill Holes in the Dental Hygiene Schedule – Hayden Consulting – Where Your Success in Business and Life Matters! Pingback: Dental Practice Management Ideas for October – Hayden Consulting – Where Your Success in Business and Life Matters! Pingback: Dental Marketing and Practice Management Ideas for January – Hayden Consulting – Where Your Success in Business and Life Matters! Pingback: Why Plant Dental Marketing Seeds Of Greatness? – Hayden Consulting – Where Your Success in Business and Life Matters!